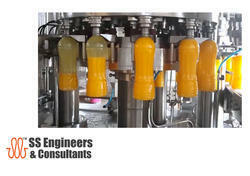 Pioneers in the industry, we offer juice processing plant and machinery, jar filling machine & jar inside & outer washing machine and fully automatic rinsing filling and capping machine from India. The process of making juice can be made out of fresh fruit, vegetables. 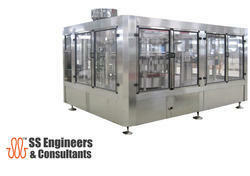 We manufacture all the equipment for juice extraction. 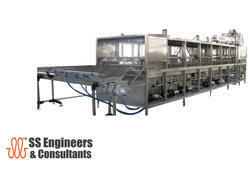 The process line includes fruit and vegetable storage, selection, cleaning, and extraction. Automatic jar inside washing machine is exclusively used in washing inside of the jar. The production line can do automatically washing, sterilizing, with a good appearance, easy operate, low-loss energy and save water, high working efficiency. The frame of the machine is welded by SS square tube, with the characteristic of high intensity, good rigidity, lightweight, aesthetic appearance, easy washing etc. with 3in1 filling monoblock combined with rinsing, filling and capping, it is innovated and designed in the requirement of milk, natural juice, synthetic juice, carbonated drink, pure water, and mineral water, on the bases of introducing, digesting and absorbing advanced technology.